A shimmering metallic origami elephant stands out from the pack. The elephant was folded as part of a campaign to raise awareness about poaching, called 96 elephants. More than 200,000 paper elephants were sent into the Bronx Zoo as part of the campaign, and the 78,654 that went on display at the zoo earned a Guinness World record on Nov. 17, 2016 for the largest origami elephant display. 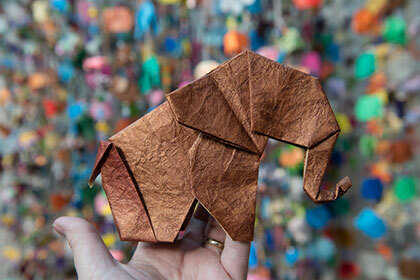 The Bronx Zoo has been taken over by a horde of adorable animals of an entirely new species - call it Elephas origami. The zoo, run by the Wildlife Conservation Society (WCS), has officially amassed the largest display collection of origami elephants in the world, earning it a spot in the Guinness World Records. The official tally of 78,564 more than doubles the last record holder, the Zoological Society of London/Whipsnade Zoo in Great Britain, which displayed a paltry 33,764 origami elephants in 2014. "WCS's Bronx Zoo received these gems of folded paper from all over the world and assembled them into this gorgeous display as a simple gesture that sends a powerful message to the world that we are standing together to save these majestic animals," John Calvelli, WCS' executive vice president for public affairs, said in a statement. Because the display is so enormous, not all of it is open to the public. However, many of the paper pachyderms will be part of a holiday exhibit open to the public through December. The project was part of the 96 Elephants campaign, an initiative run by WCS and directed by Calvelli to combat poaching and the illegal ivory trade. The campaign takes its name from the number of elephants killed every day by poachers. The record-breaking number of paper elephants is roughly double the number of elephants killed by poachers each year, Calvelli said.